William Terrell launched Terrell’s Potato Chips in 1961. He started with donuts, breads, and cookies. He sold other snack foods in the late 1950’s, and had built his distribution up to five route trucks, when he came up with the idea of selling his own potato chips. William found a used potato chip cooker in Pennsylvania, and proceeded to set up a full potato chip line in 1961. Things were not always easy, but hard work and perseverance kept things going. After his son, Jim, got out of the service he joined his father in the potato chips business. In 1970 his plant and land were bought out by the state to make room for a new highway, Route 481. This forced him to search for a new plant to produce his potato chips. He bought out a competitor, also in Syracuse at that time, called Crispy Maid Potato Chips, and moved everything to that chips manufacturing plant on Midler Park Drive, where Terrell’s Potato Chips operates today. Crispy Maid Potato Chips also had five route trucks. In 1975 James Terrell took control of the business after his father's retirement. In the late 1970’s, when The Bachman Company developed their own distribution to the stores, Terrell’s expanded their line from just potato chips, to include pretzels, cheese twists, tortilla chips, and other related products. In the eighties and nineties the company continued to expand, picking up distributors in Buffalo and Albany, and also adding more route trucks to their fleet, to as many as 27 trucks. 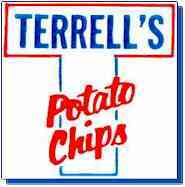 In 1995 Terrell’s acquired Jean’s Potato Chips, which opened more opportunities for the Terrell’s Potato Chip Company. Today, with sales topping 7.5m they operate one 1,500 pound per hour fryer, three to four days per week. They service corner stores, restaurants, major grocery chains, wholesale clubs, and everything in between. Terrell’s Potato Chip Co., Inc.